Oh, how I love spring. Everything is just bursting with life. 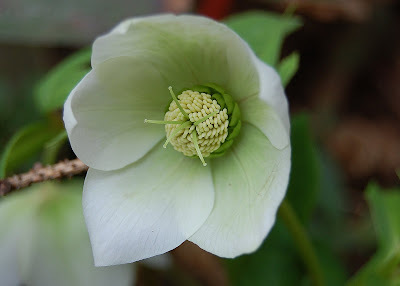 The hellebores and the forsythia are blooming at our Little Red House right now. More to come soon. I try to spend as much time as I can out in the garden, and there is a lot to do! We are also smack in the middle of the spring track and field season, and spring travel soccer. Some days I don't know if I'm coming or going. I'm sure you all know how that feels. So from our crazy, busy house to yours -- Happy Saturday, dear bloggers! Happy Saturday to you, too. I love every day, but I have a special fondness for weekends. I'm having my coffee now, and just enjoying the quiet. Happy Saturday to you too Mary! It's 9.30pm Saturday night here, so our weekend is half over now but it's been lovely so far! Hope yours is too sweetie! The same to you Miss Mary! Have a lovely day. You flowers are MUCH prettier than anything blooming around our part of the country! Gorgeous images! I can hardly wait to see our gardens blooming! Your pictures are just beautiful! I like the new header, but miss the other one too. I love spring, your pics are beautiful. The blooming flowers are definitely one of my favorite parts of of Spring. That and all the cute baby animals running around. They look so carefree and like they are truly enjoying their little frolics. Spring makes me feel like I want to frolic and have fun. The bluebonnets are "a-bloomin" in the heart of Texas. WELCOME SPRING! Soon we'll have a wildflower quilt on the sides of our highways. Happy Saturday!! Those flowers look so pretty... We had a few snow flurries earlier today (winter will just not end!) but I did notice the other day that my tulips are starting to come up... just the leaves (no flowers yet), but that's a sure sing that spring is finally on its way!!! I can't wait to begin my gardening! I usually wait until May to plant flowers and herbs and vegetables. Enjoy all the sports activities! Some of my fondest memories are sitting on a cold bleacher with a thermos of hot coffee cheering on the team. It's over way too soon. Yay! The forsythia is in bloom! Now that is exciting news...can't wait for that to happen here. oh your hellobores are a sight we are still up to our tusses in snow ..a vwry late spring so again thanks for the spring pictures.. love your white covered dishes too.. So good to see such lovely spring flowers bursting! Forsythia is just one of my favorites! I didn't get too many blooms on mine this year for some reason. If it ever stops raining, I'm headed out to get some shots of the few blooms it does have. So happy spring has sprung for you Mary! It's late Sunday night as I write this and it's just now that I'm getting to visit your wonderful blog again. Mary, the first picture on this post is simply beautiful! I have got to start taking close-up flowers again. I love it. Loads of Fun for $12.99!